To re-design the manual espresso grinder, we considered our goals of perfect alignment, precise stepless adjustment, ergonomic design, and the highest quality grind precision. The Helor Flux has been developed and built on a foundation of these goals. A professional grade espresso grinder in a compact profile. 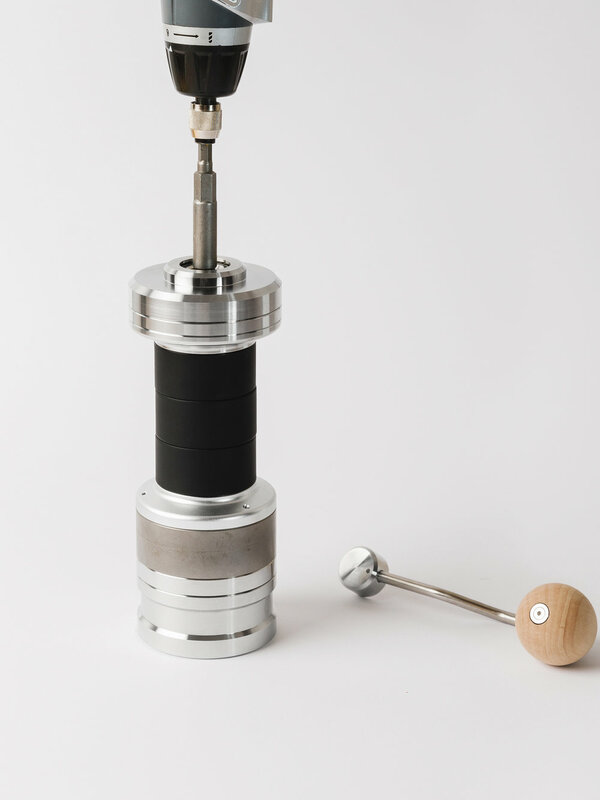 Machined from a single block of aluminium alloy, Flux’s unique Unibody construction eliminates the common issue of shifting internal parts found in most manual and electric coffee grinders, simplifying and strengthening the internal structure and providing the best achievable alignment. 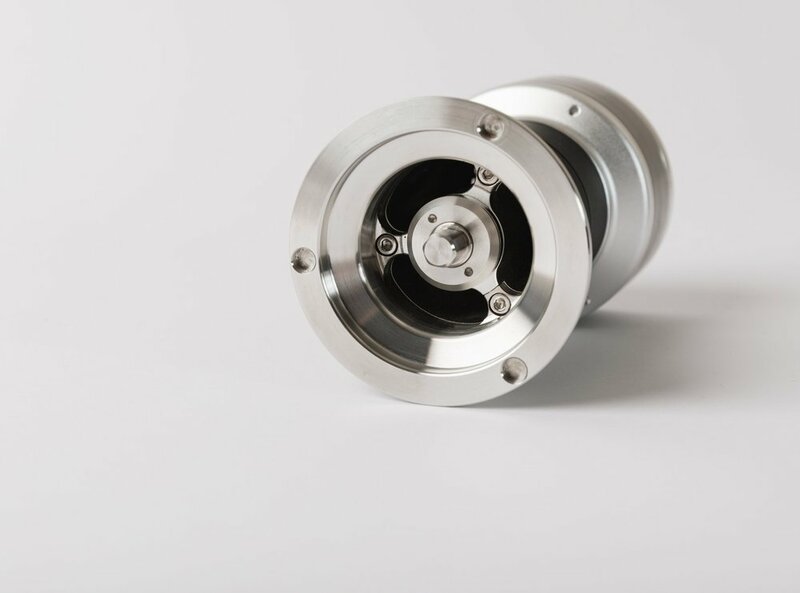 Helor Flux’s straight-down design allows an optimal grind trajectory, promoting more efficient grinding with less cleanup, limiting grounds retention to less than 0.1g. It has been shown that an important determining factor in coffee consistency is the output particle distribution from the grinder. A more narrow distribution of coffee particle size allows for a more even extraction when making espresso. Hand grinders often produce a very wide particle distribution due to the instability of the internal mechanism or improper alignment of burrs. The Helor Flux has been engineered for stability, its Unibody design ensuring proper alignment and a consistent particle distribution. 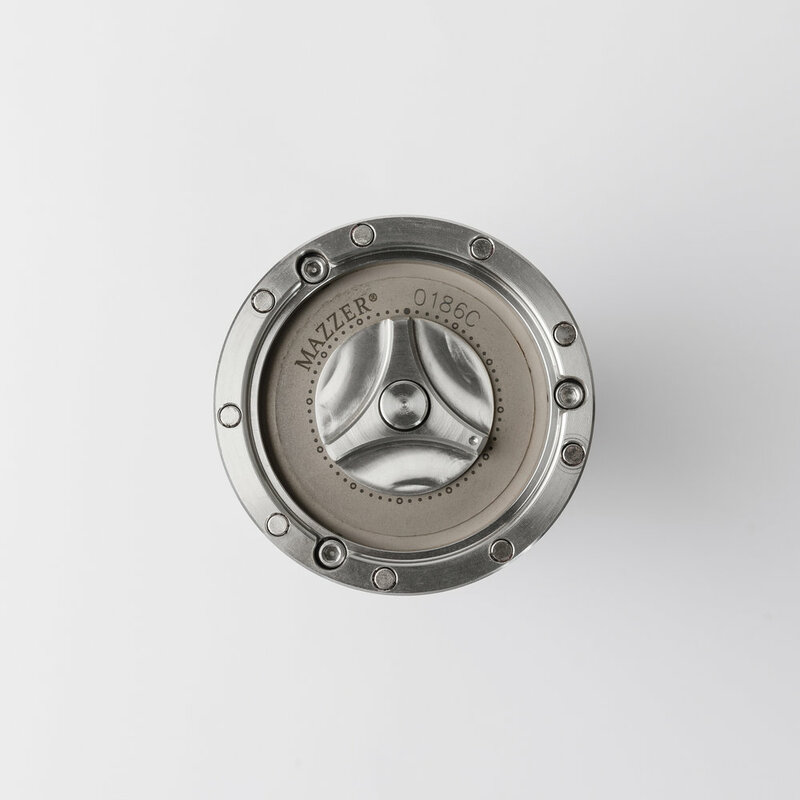 The stepless and self-locking adjustment knob of the Helor Flux enables the most minute grind variations, while an increased burr diameter means 5x greater adjustment precision than the Helor 101. Precision bearings installed in the grinder body promote stability and minimise maintenance needs. The Helor Flux is a reimagining of the conventional hand-grinder. User-focused, its ergonomic form allows for comfortable daily grinding. Flux’s soft silicon grip is designed to fit securely in the hand, reducing slip and minimising friction while curved edges accommodate for easier day-to-day cleaning. To alleviate muscular stresses during operation, the Helor Flux features an inbuilt gear mechanism driving the crank arm. This 3:1 gear ratio reduces the necessary force needed to move the impressive 71mm burrs and minimises speed fluctuations, making even the finest espresso grinding near-effortless. 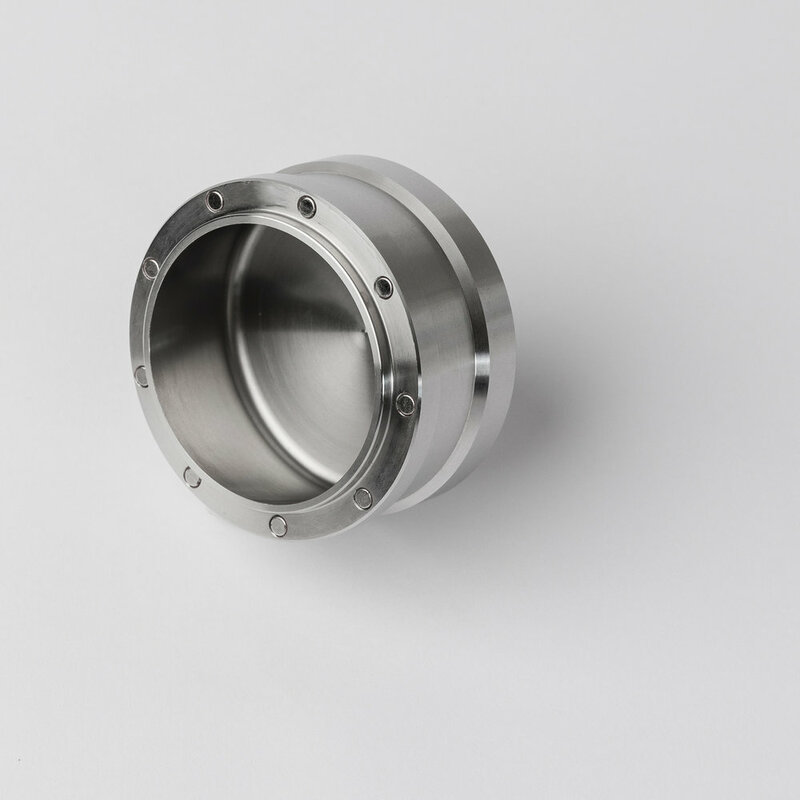 Another feature of the Flux is the compatibility for integration, its crank arm is easily uninstalled and can be fitted with a standard electric drill bit for automatic grinding. When making espresso coffee, loading and dosing ground coffee can be a messy complication, often requiring additional equipment to funnel grounds from grinder to portafilter basket. The Helor Flux has been purposely developed to simplify this process. Featuring a durable magnetic grounds catch at its base, coffee beans can be weighed out and loaded using this catch and once ground can be effortlessly dosed directly into any standard 58mm portafilter basket, its perfect fit and strong magnetic hold ensuring a fast and clean transition with less waste and easy grounds distribution. Exceptional espresso brewing relies on highly precise, effective and durable burrs to achieve a narrow distribution of particle size and a consistent grind output. To create a manual grinder for the purpose of espresso making, we looked to professional electric grinders. The Helor Flux features a 71mm Mazzer Robur burr set, considered by many to be the highest benchmark for conical burrs, these durable and highly effective burrs provide more efficient and consistent grinding dynamics, while their larger profile allows more precise stepless adjustment and an increased lifespan compared to smaller burr sets. Easily removable, Flux’s burrs allow for easy cleaning and general maintenance and can be simply realigned into the unibody frame.